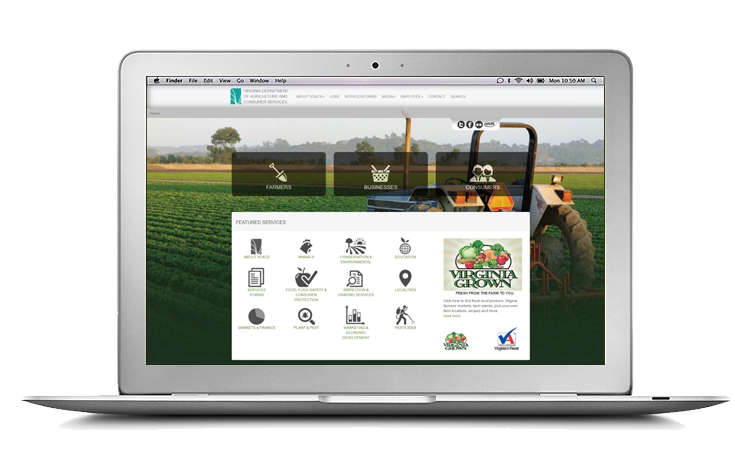 Virginia Interactive (VI) has been a leader building websites for both local and state government entities for 16 years. VI has been a long-standing partner with the Commonwealth of Virginia in managing the award winning Virginia.gov portal and over 110 entity websites. VI offers a vast array of citizen-centric digital government services and information that must be presented in a logical, organized easy to find manner based on user service. VI is committed to creating and designing websites that are user-friendly, intuitive, simple and straightforward, effective and uniquely reflects the sensibilities of your agency, university or locality, while serving the needs of the citizens and constraints. In addition, VI will leverage our history of success in government website design and content best practices to transform your website from a departmental organizational design to a user driven, purpose designed site structure. Virginia Interactive is the Commonwealth’s expert on usability and accessibility for web sites and online services. Over the past few years, Virginia Interactive was instrumental in assisting with the Commonwealth’s Policies, Standards and Guidelines (PSGs) for executive branch agencies. These standards were developed to ensure web sites would be usable, share certain common look elements and comply with the American Disabilities Act, 508 Guidelines and the W3C Web Accessibility Initiative. Virginia Interactive will create a detailed and customized report of the site or service. The report will outline any specific accessibility problems, highlight what needs to be changed and provide suggestions on how to make the change(s) in regards to ADA and/or 508 guidelines. Virginia Interactive will evaluate the best method for a site or service to accomplish the goals set for it by the agency. General "best practices" approaches are outlined, including proper navigation design and information architecture. Virginia Interactive will make the changes required for a site or service to meet "best practices", ADA and/or 508 guidelines, as outlined in the above mentioned reports.